The family of murdered Belfast defence lawyer Pat Finucane emerged from a meeting with British Secretary of State, Peter Hain this week demanding to know, "who the hell" is running the Six Counties. 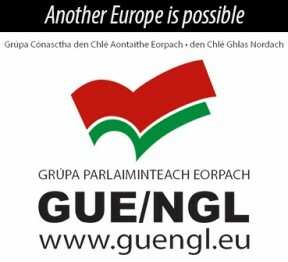 The meeting with Hain underlined "the extent to which this government is under the control of the intelligence services", said Michael Finucane. Hain rejected the call for an independent international judicial inquiry opting for a restricted probe under the recent Inquires Act. A probe "on terms which are acceptable to the very establishment responsible for murder and collusion", said Michael. The British Government is cloaking the tribunal in secrecy because agencies at the heart of the collusion controversy were refusing to co-operate. "The Secretary of State had every chance in the world to play a useful role. The indications are he is not willing to do that, neither is the government," said Michael Finucane. The Inquiries Act 2005 effectively gives the British Government full control over what is, and is not investigated. The British Government will be able to dictate what is published, who attends and it even has the power to suspend the inquiry at any stage. In addition the family are not guaranteed legal expenses. Holding the inquiry under the 2005 Act makes a mockery out of the notion of any kind of independent and fair inquiry into the murder. It is the height of hypocrisy for London to go through the motions of an inquiry with the ability to pre-determine the outcome. The 2005 Inquiries Act has been universally condemned by human rights groups. Any investigation carried out under it's auspices will have no legitimacy. In all probability the legislation was drafted specifically to deal with the embarrassing legacy of British actions during the conflict. But many are determined that it must not be allowed to get away with it. Speaking after the unsatisfactory meeting between the Finucanes family and Peter Hain, Sinn Féin spokesperson on Policing and Justice issues Gerry Kelly pledged his party's ongoing support to the family in their campaign for the truth. Kelly said: "Despite a public commitment to establish an inquiry into this killing the British Government has subsequently brought forward legislation which, in the view of the Finucane family would ensure that any inquiry held within these parameters would not deliver the truth. This situation is unacceptable.
" 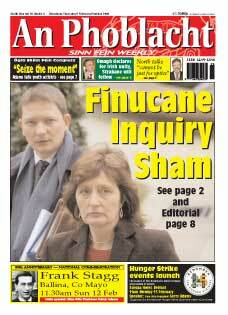 Sinn Féin will continue to support the Finucane family in their campaign for the truth. It is also important that the Irish Government do likewise. They need to make it clear to the British Government that the sort of concealment and evasion which has been the mark of the British Government approach to this case up until now and also to the inquires established into the Dublin/Monaghan bomb and the Séamus Ludlow case is unacceptable and must end."